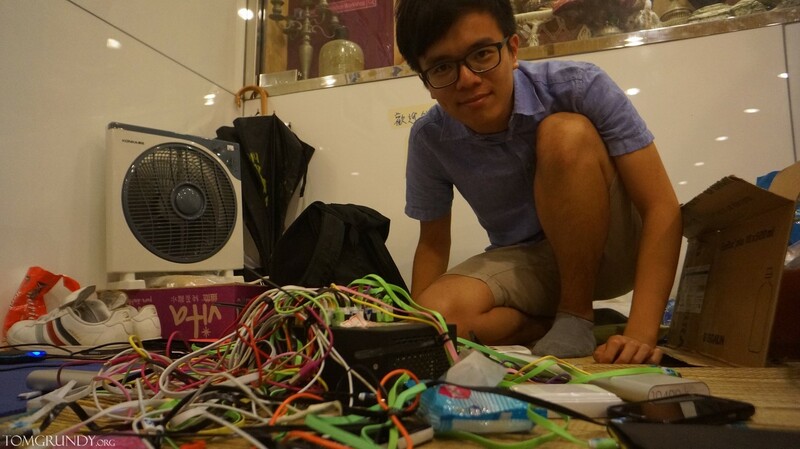 “It’s made in China so we don’t trust it would even blow up properly.” Sirius Lee (his real name) has few concerns over the safety of the crude-looking 40-socket USB charger he purchased for HK$500 (US$64) from the mainland. The contraption sits in a mesh of cables at a mall near the main Occupy Central protest camp in Hong Kong. Over the past six days, over 2,000 people have entrusted their phones and tablets to 22-year-old Lee and his team of 30 friends who man the “Recharge Corner” in shifts. Smartphone-addicted Hong Kongers at the protest camp are so grateful for the free service, they have given food and chocolates to the team. Should the police move in, Lee’s team can escape rapidly into the metro system after pulling down an “emergency sign” that tells people who to contact to retrieve their phones.